The dress arrived and I like a lot of its features. The jersey is very good quality for the price point and the dress is cute and incredibly comfortable – like going to work in your pajamas. I ordered the red version without thinking of the visual effect of having a bright red stripe across the bustline. In my standard size, the dress is fitted through the shoulders and upper torso, and swings away from the body through the waist and hips. I felt like there was way too much emphasis on my chest (32d) in this dress. I think this dress would be really great on a relatively flat-chested, pear-shaped or rectangular woman. 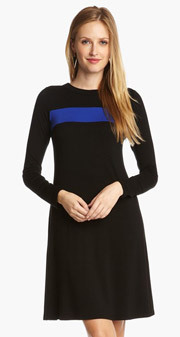 I bought this dress with the blue stripe. Love it. It is an easy fix for quick dressing. It does not cling and is very soft. Looks great with boots or booties.